Been saying this for a while… “Illegal Immigration” isn’t causing a problem with jobs in America. And the conservative types who want to say that Miguel the Farm worker is stealing “back jobs” are full of crap. Who’s stealing millions of American jobs are “guest workers” using H1 Visas. Now – to my lone conservative reader, that doesn’t mean run out and hang Iqbal in effigy from the nearest lamp post. (It isn’t Iqbal’s fault. Somebody wants to pay me the equivalent of half million a year to go to India to do what I do… I can develop one hell of a taste for curry.) The people you ought to be hanging (and not just in effigy) have very “American” names and are at the head of the tech companies. With 3 million black kids currently in college, a historical high – many of these kids are taking courses and earning degrees in the STEM fields. Specifically in Telecommunications and Computer Science. Several studies including the seminal “The Shape of the River” have pointed out that black kids have a harder time achieving a Bachelors than white or Asian kids – but once they do they are about 3.5 times more likely than their white American counterparts to pursue post gradate degrees. Indeed, this has been the motivation by conservatives, and the SCUMUS 5 to try and close that door to higher education through re-instituting Jim Crow in College acceptance by destroying any program where disadvantaged minority kids might get into college even distantly under the banner of Affirmative Action. Grabbing a bowl of popcorn and a beer, and rolling up in front of the big screen each night to see recounts of the daily carnage in the inner city, as those kids kill each other over nickels and dimes is far more gratifying to conservative’s racism than potentially seeing any of those minority kids join the American commerce as productive members or business owners. 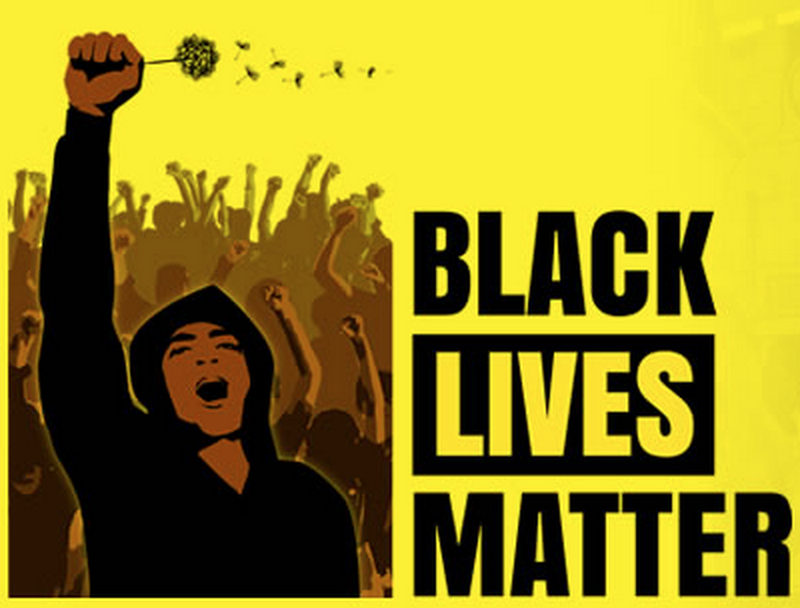 It isn’t just having a black President as “the boss” thats sends those folks into racial apoplexy – they have the same reaction to black business folks in leadership positions. As such, the “program” to keep those young folks from getting an education is a Crusade on the 12th Century model of throwing the Muslims out of Jerusalem. Salzman, Lowell and Kuehn: When Bill Clinton was president, wages for American IT workers were climbing and American students were clamoring to become computer scientists. Fifteen years later, average real IT wages are no higher. It is no coincidence that high-tech industries are now using guest workers to fill two-thirds of new IT jobs. The IT industry and its many supporters argue that without this infusion of guest workers it will starve because of the scarcity of domestic native and foreign-born citizens with the right aptitude or interest. Researchers like us, who have the temerity to suggest that the evidence fails to justify importing ever more guest workers, are accused of being anti-immigrant, anti-capitalist, Luddites, or just plain troglodytes who can’t fathom the character of modern technology industries. For those of us who simply want to get the policy right, however, this is a debate about America’s policies for creating good jobs, strong technology and an innovation-based economy. We welcome immigrants and support an immigration policy that draws the best and the brightest and provides opportunity to newcomers. But policy should not be about targeting government giveaways to a few industries by supplying ever more guest workers when there is an ample domestic supply of qualified graduates and workers. Our analysis of the data finds that high-skill guest worker programs supply the preponderance of all new hires for the IT industry. The inflow of guest workers is equal to half of all IT hires each year and fully two-thirds of annual hires of workers younger than 30. Can it be a coincidence that wages in IT jobs have been stagnant for over a decade? The chart below shows trends for programmer and system analyst jobs; wages for other IT occupations follow similar trends. 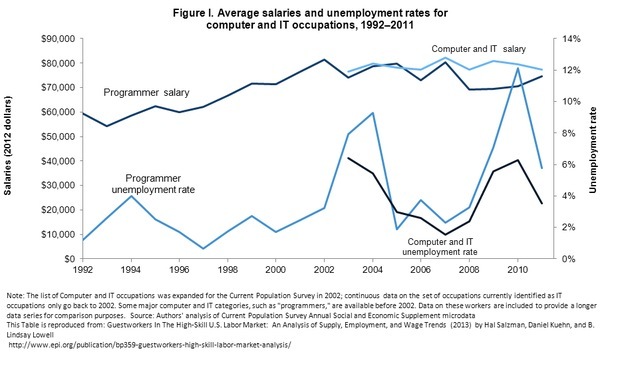 In the above graph of average salaries and unemployment rates for computer and IT occupations from 1992-2011, wages for IT workers have held steady over the past decade. This table is reproduced from “Guestworkers In The High-Skill U.S. Labor Market: An Analysis of Supply, Employment, and Wage Trends” (2013) by Salzman, Kuehn and Lowell. At the same time, U.S. colleges are graduating more than twice as many science, technology, engineering and math (STEM) graduates than the number of STEM openings generated by our economy each year. In short, there is little justification to support the escalating numbers of new guest workers called for in the Senate’s S744 legislation.Why then did it pass? Today’s guest worker programs target an important industry with a substantial hold on the public’s imagination. But guest worker programs should be justified by national interests, not by the shortsighted interests of a particular industry. Proclaiming “shortages” where there is no evidence of them is not only disingenuous, it obscures the likely impact of large-scale guest worker programs, which stand to hurt all STEM grads, but especially minorities who are underrepresented in high-tech, as well as other foreign-born workers who compete most with newcomers. Can anyone argue that prioritizing access to good employment for high-skill domestic workers is not in the national interest? Isn’t Ours a Market Economy? Markets are supposed to reflect demand through the price mechanism. In the case of labor, the “price” is wages. How can it be, then, that if the IT industry is experiencing labor shortages, wage levels in this highly profitable industry are no higher than they were in the last millennium? How can an industry expect to attract the best workers without raising wages? Is there what economists call a “market failure” here? All the evidence suggests the IT labor market is still bound by the usual dynamics of supply and demand. When we look at the trends of the past 20 years, we see that when wages increase, the number of computer science graduates increases. When wages fall, the number of graduates falls. When the supply of guest workers increases, wages stay flat, and too many domestic students must find employment in other fields. Some commentators argue that this last result is good for the economy: science and engineering skills are now being used in millions of non-STEM jobs. But an alternative view is that far too many domestic STEM graduates are in jobs that do not fully use their education, which represents a loss of our greatest source of innovators. Come on, giving citizenship to 11 million (maybe 15-20 million by the time it is completed) illegals will hit the employment scene for blacks very hard at all levels. Not just that. Once the illegals become citizens, many of them will immediately become eligible for welfare and other social programs, harming AAs in many ways that way as well. It’s just plain and simple… arithmetic, folks!